Jane Langill, Killington’s first ski nurse, swung through town with her oldest daughter Martha Thursday, Aug. 16 and stopped by the Mountain Times to introduce herself and share a few stories. “We lived in the little red farmhouse where Aspen East now sits,” she said. Langill and her husband Stephen, raised four children there: Martha, Heather, Christian and Neal. Martha, their oldest, started her schooling in a two-room schoolhouse before the elementary school was built, she recounted. Langill’s stories from her five years as a ski nurse are chronicled in the self-published memoir ,“Mountain Memories.” Two copies are available at the Sherburne Memorial Library. The job had her riding on the back of the industry’s first snowmobiles (a Ski-Doo) to the scene of severe accidents. “One day a young woman fell on the slopes and her boyfriend, who had been skiing right behind her, couldn’t stop in time, and skied right over his girlfriend’s face, resulting in severe, deep lacerations. She was taken to the hospital where several stitches – at least 30 – were required,” she recounted in the book. But it wasn’t all serious business. Langill recounts some comical moments, too, including the time “a tall redheaded young man entered the patrol room, having split the seam in the back of his tight-fitting ski pants. His backsides were as red as his hair, and the man was freezing. He removed his ski pants and wrapped himself up in a blanket while I sewed the seam. The foolish man didn’t even wear underwear – neither thermal nor otherwise. Tight-fitting ski pants were the fad then, and he certainly was in style,” she wrote. In 1968, after her fourth child was born, Langill felt she could no longer keep up with the demands of being a mom and a ski nurse. “My family needed me full time,” she wrote. In 1988, after all four kids had graduated from high school, they sold the farmhouse on Route 4 to Cathy and Lee Quaglia and moved to Rutland. The farmhouse was eventually moved down the road and placed next to the Church of our Savior on Mission Farm Road where it remains today. Jane Langill continued to practice nursing at Rutland Regional Medical Center, officially retiring in 1998. Langill now lives in Rockford, Illinois. 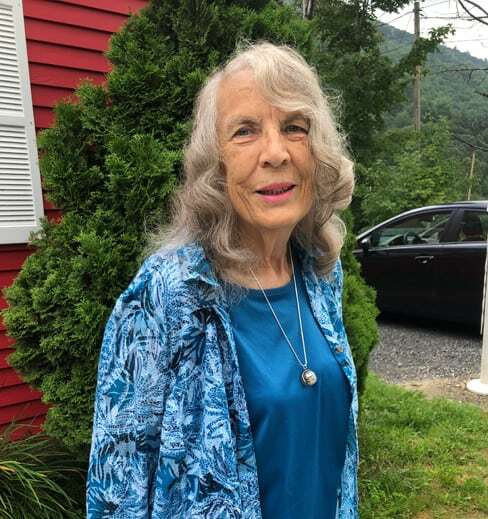 Her husband, Steve has passed, but was joined by Martha for the visit to Killington to see old friends and neighbors many of whom gathered at Seward’s Restaurant in Rutland on Saturday. Linnea Minard was one of them. She described Langill as “a treasure, a blessing to all in our community” and said Jan and Stephen were very active in the community and church. “As far as I’m concerned the bond of love and friendship can never be broken. She touched many hearts and it’s so nice to keep in touch,” said Minard.